Back in September, Google announced that the prepaid card program through Google Wallet was coming to an end and that customers could receive refunds for leftover funds around October 17. 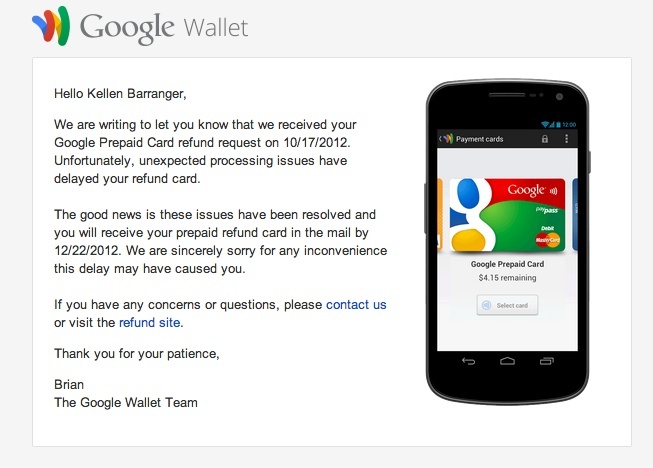 Sure enough, on October 17, the refund form went live, giving those of us with non-working Google Wallet apps (thanks Verizon!) or those with remaining balances a chance to get their cash back. Some of us weren’t sure if it would work for non-supported devices, though, since some of the form’s boxes had to be left blank, again, thanks to non-working Wallet apps. Also, after filling out the form, users who requested refunds were left in the dark as to when they may receive those funds. Up until moments ago, when I received a status report from Google, I had no idea if or when I would be receiving a refund. According to the email above, that silence was due to “processing issues” that have now be resolved. If you have yet to receive your refund, there is a good chance that it will be in the mail by December 22. Google Looking to Replace Head of Mergers and Acquisitions?